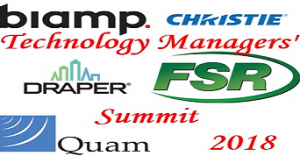 Five well known audiovisual and classroom technologies manufacturers, FSR, Inc, Biamp Systems, Christie Digital, Draper, Inc. and Quam Nichols, have partnered to offer a full day of cost free training to AV industry technology managers. The Technology Managers’ Summit (TMS), formerly the Higher Education Technology Summit (HETS), was originally created for college and university managers of educational technology to combine a day of product training, networking and peer-to-peer discussions in a fast moving format. After considering the great success of this format among those in higher education, the team of 5 manufacturers decided to expand the audience to all technology managers including education, corporate, government, hospitality, worship, etc. Also new this year: Tim Albright of AVNation will be the TMS host and moderator. peer-to-peer panel discussion focusing on the challenges and successes of designing systems in open architecture workspace, flexible training rooms, huddle spaces and more! fun! We are moving the third TMS down south- to an area known for their southern hospitality and delicious food! *open to technology managers ONLY.